In Tanzania in the late 1950s-early 1960s, there was a wonderful group called the “Cuban Marimba Band” – wonderful, in part, because they weren’t Cuban and there was no marimba on their records, whatsoever! Already, they’d have had my attention. But they were, in fact, one of the best popular groups in the region with a varied sound, led by an important musician, appearing on one of the most interesting East African labels. That’s saying a lot for an area that was bursting with musical styles and independent 78 rpm labels – at least 50 of them – immediately after World War II. I was first introduced to the group by erudite collector and friend Mike Kieffer, and from John Storm Roberts’ important LP Africa Dances – the groundbreaking collection of 1960s African pop. Salim Abdulla was apparently from Morogoro, in the southern highlands of Tanzania. His first group was called “La Paloma,” and I can find no proof that they recorded anything on disc (though they certainly could have). However, at least one source claims that he also formed the Morogoro Jazz Band, who had a lengthy career after Abdulla had presumably left the group, recording for various independent labels on 78s. At the time in East Africa, there were many dance bands, some which played different types of syncretic, orchestrated African jazz, and others which played taarab music with strong influences from the Middle East, as well as music influenced by Indian and Bollywood orchestras. Morogoro Jazz was just one of many – there was the Coast Social Orchestra, the Dar Es Salaam Jazz Band, the Atomic Jazz Band, and countless others. The Cuban Marimba Band fits right into this lineage, although they were clearly one of the best at muziki wa dansi – straight up dance music. 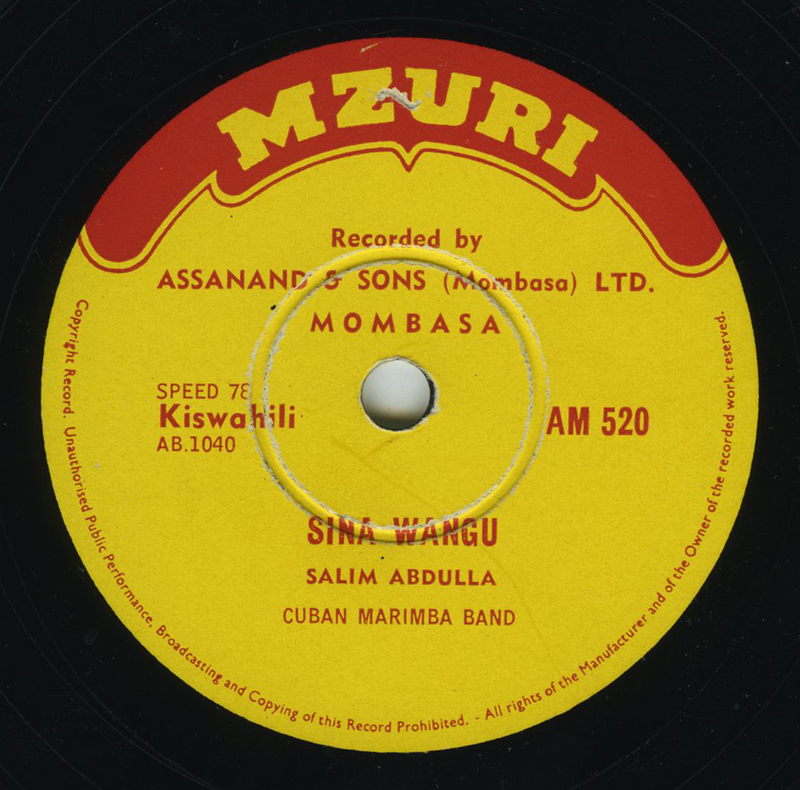 They recorded for the Mzuri label, which began around 1955 in Mombasa, Kenya. The Mzuri label…well, you know, for years collecting African 78s, I’d never seen a Mzuri 78. I’d never even known they’d existed, except on 45s. But, yes, exist they did – and they are testament to two things: 1) they prove that they were a successful company, issuing over 500 78s alone, before and during the gradual shift over to 45 rpm, and b) they had some of the very best talent, and issued some of the most interesting East African music during that time. One person’s opinion, but I believe their output is extremely special. They are also tough as nails to find. Anyway – Mzuri was started in the mid-50s by Indian businessman M.J. Shah, who had been active recording East African music since 1939. Shah was convinced that the other East African labels had no real recording skill, and didn’t know how to properly capture a group sound. According to historian Werner Graebner, Shah recorded just with one microphone and a Ferrograph tape recorder. He would record bands in his warehouse in Mombasa, as well as travel to record groups in Dar es Salaam. Although I basically agree, Mzuri was far ahead of the pack in terms of quality, it shouldn’t be compared to western standards – there are plenty of Mzuri discs with tape flutter, edits, mistakes, and all kinds of weirdness. It was still the wild west in terms of recording, and records were made in all manner of conditions. Some Mzuris were pressed in Nairobi, some Germany, some Uganda…whomever offered the best deal, probably. Salim Abdulla continued recording both with his Cuban Marimba Band and as a solo artist, until his death in 1965 from a car accident. John Storm Roberts credits Abdulla and his band as groundbreaking, creatively mixing local taarab “harsh, sad” vocal styles with the Cuban influence that had swept Africa from the Congo, eastward. This track, “Sina Wangu,” translates to something akin to “I have nothing” and was recorded in the early 1960s. It has not been compiled either by Roberts, or on the long out of print Dizim CD Salum Abdallah and Cuban Marimba: Ngoma Iko Hoku. The well of African music is always far deeper than us in the West imagine. Thanks to MK. Much info from works by Werner Graebner. Thanks Jon! You really keep up the good works! If this is a representative track, then I second that one person’s opinion. Thanks for sharing it with the world. I love this band and Salim Abdulla is such a distinctive singer. Sounds like it predates any of the tracks on the Dizim CD? … and (where’s my manners?) – thanks for posting! Hope you Enjoy- and if you want to, feel free to download and share it. The whole thing is legally cleared!